“It’s like drowning in a cup of cappuccino” – said an Eviva tour guide to his guests. Traveling Vietnam to experience the country’s wonderful and natural beauty from the bustle of Mekong Delta to the peaceful green rice fields across the north mountain areas, along with its historical places and ancient traditions, is the interest of many people around the world. Not just lying on the beach all day which can be exhausting, tourists will also have chance to experience a very special service in the mud bath, a treatment that make you take the stress out of your body and clear your mind perfectly. With natural white-clay formed from volcanic ash, 100% pure, mined and processed at the mine at Lam Vien plateau with healthy minerals such as iron, Ca2+, Mg2-, Cl- or K+, the mineral bath will help the body to absorb and provide healing effect for organs and the body system in general. In addition, the underground mineral water combines with fresh flowers and the essential oils is one of the most favored service in Mui Ne to release stress and relax the skin. This is one of the main attractions for tourists when coming to Nha Trang, which is located behind the age-old Ponagar Cham Towers, contains 25 hot springs and 12 mud baths with individual names. Apart from experiencing the salty mineral-rich spring from 100-meter underground water, visitors will also be provided such services like rejuvenating treatments with flowers and medical herb, soaking in hot mineral water or in mineral mud. There are dozens of hot mineral springs (40oC to 80oC) flowing for visitors in the mangrove forest at Binh Chau and also mud bath is available. 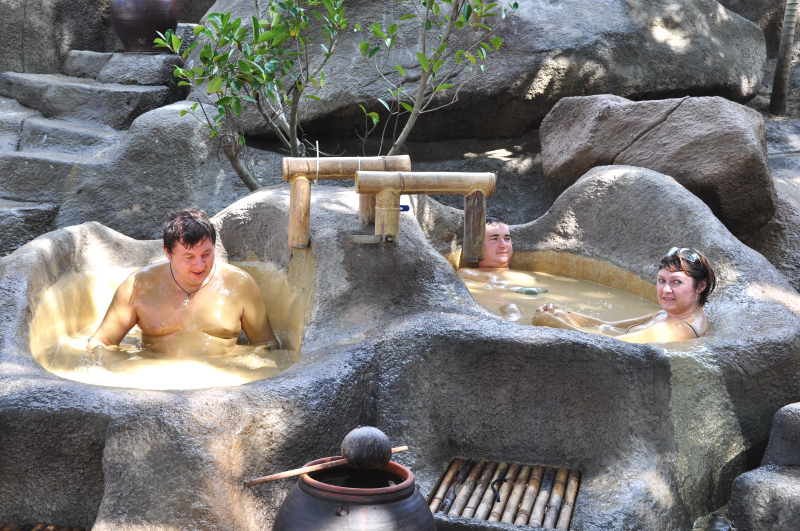 These hot mud baths and fresh air will help with rheumatism treatment. Therefore, thousands of people go to Binh Chau every day to take this therapy with full of excitement and refresh.